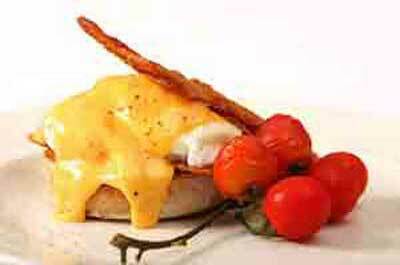 Well prepared and attractively presented food. Features locally grown and/or organic produce and poultry, and grass-fed meats. Can be noisy downstairs near the bar on busy weekends. Recommended For: Diners who enjoy well prepared, fresh farm to table food with a trendy, rustic ambiance. Not Recommended For: Diners who prefer traditional dining and a less chic ambiance. Recommended dishes: When available, Roasted Wild Salmon; Grass-Fed Beef New York Strip; and the Lamb Chops Scottadita. Liquor: Excellent selection of wines and specialty cocktails. Bar scene is vibrant. Eno Terra, an Italian influenced restaurant in the historic village of Kingston in South Brunswick, serves fresh, healthy food in a rustic, trendy setting. The restaurant is operated by the Terra Momo restaurant group, and is one of a new breed of casual upscale restaurants committed to using fresh locally grown and organic foods in the preparation of flavorful, healthy, and attractive presentations. This fine dining restaurant evolved from a 19th century building with a restoration complying with environmentally conscious practices, to become a casual, elegant venue. The interior is marked with exposed brick walls and beams, square overhead lights, wood floors, wine red walls, and a large open dining room with a soothing waterfall, and windows that look out on a patio garden and rock wall. There is a another dining area upstairs along with a room for private parties. The spacious bar is attractively set around the original brickwork and timbers. The bar area offers seating with small tables for two on stools along the L-shaped wooden bar. The bar also has view of a floor to ceiling glass enclosed wine case that actually goes all the way down to the the basement. The only downside to the main dining area is that it tends to get noisy when the restaurant fills up. Dine upstairs for a quieter dinner. 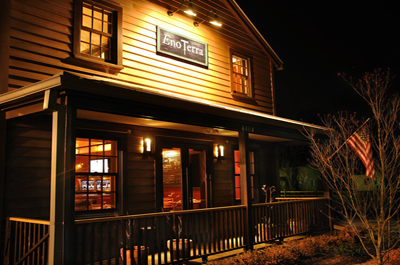 Eno Terra is one of only a few restaurants in New Jersey to be certified by the Green Restaurant Association, which considers environmental practices as well as food sources. The restaurant features the use of locally grown and/or organic produce and poultry, and grass-fed meat from a 50-mile radius. Most of the local produce comes from their Eno Terra Canal farm, and from Terhune Orchards with the cheeses from local creameries Cherry Grove and Valley Shepherd Creamery. Many of the items on the menu are cooked on their wood fired grill. The simple, loosely constructed menu enables diners to arrange their meals to suit their tastes. Save room for desserts. Most of the selections include local fruits and ingredients. Ice cream comes from Princeton's The Bent Spoon, and many of the fruits coming from Terhune Orchards. Wine is an important component of the fine dining experience the Eno Terra with a wine cellar that has over 7,000 bottles and over 350 selections with a wide price range to choose from. The wait staff is well trained, knowledgeable, and anticipatory. Attractively decorated for the holidays. 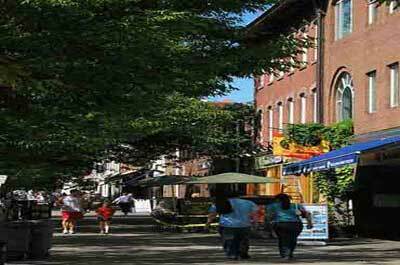 New Jersey Leisure Guide contains the largest source of extensive and unbiased New Jersey restaurant reviews. Data is gathered from our viewers e-mail restaurant comments, Internet and print research, and professional restaurant critics. The data is analyzed and a review created. Staff personal visits are sometimes made to corroborate and/or tweak results. 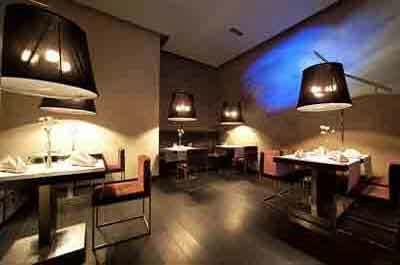 Restaurants that appeal to younger diners who seek out restaurants with a refreshing, energetic, casually elegant dining experience that is a departure from the "Old World" stuffy style of dining.